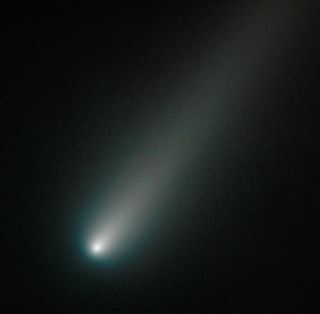 NASA's Hubble Space Telescope took this photo of Comet ISON on Oct. 9, 2013, when the comet was inside Mars’ orbit and about 177 million miles from Earth. The nucleus of ISON appears to be intact. Skywatchers take heart: The potentially brilliant Comet ISON appears to be holding together thus far on its perilous journey around the sun. Some astronomers have predicted that Comet ISON will break apart before its Nov. 28 close solar approach, when the icy wanderer will skim just 730,000 miles (1.2 million kilometers) above the surface of the sun. But a new photo from NASA's iconic Hubble Space Telescope suggests that ISON remains intact for now. "Moreover, the coma or head surrounding the comet's nucleus is symmetric and smooth," they added. "This would probably not be the case if clusters of smaller fragments were flying along. What's more, a polar jet of dust first seen in Hubble images taken in April is no longer visible and may have turned off." Comet ISON was within the orbit of Mars and about 177 million miles (285 million km) from Earth when the new photograph was taken, officials said. ISON, which was discovered by two Russian amateur astronomers in September 2012, is apparently making its first trip to the inner solar system from the distant, frigid comet repository known as the Oort Cloud. If the comet survives its close solar encounter next month, it could put on a great show for skywatchers in early December, experts say. Astronomers are also rooting for the comet's survival. They hope to learn a great deal about its composition by noting which gases boil off ISON as it gets closer and closer to the sun. In fact, researchers have organized a global Comet ISON observation campaign, enlisting a number of instruments on the ground and in space to track the icy body's progress. Many of these observations are planned for after the comet's close solar approach, when it will be easier to see from Earth. Nobody knows how Comet ISON will fare, of course. It's difficult to predict the behavior of any comet, and especially tough to do so for "dynamically new" objects like ISON that have never approached the sun closely before. Nonetheless, some scientists have expressed optimism about ISON's chances. With a nucleus estimated to be between 0.12 miles and 1.2 miles across (0.2 to 2 km), the comet appears to be big enough to avoid destruction by the sun's heat, a recent study reported. And as long as ISON is a "typical" comet in terms of density and spin characteristics, it should resist breakup by our star's gravitational pull as well, some researchers say.